So that's all of 'em! 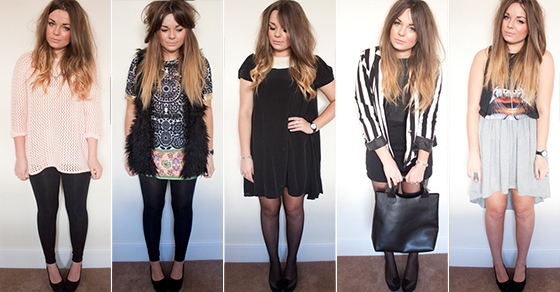 A whopping 164 outfit posts all laid out for easy viewing! I actually have omitted a few, and didn't include any of my snippet style posts or holiday outfits. 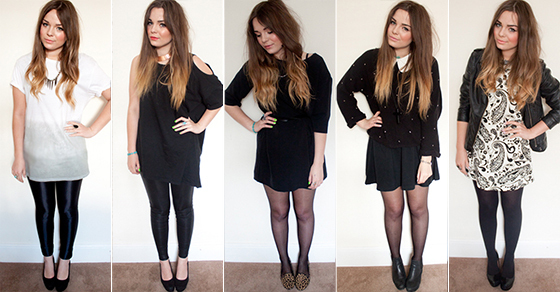 But overall Im really interested in this visual record of what I wore in a year. 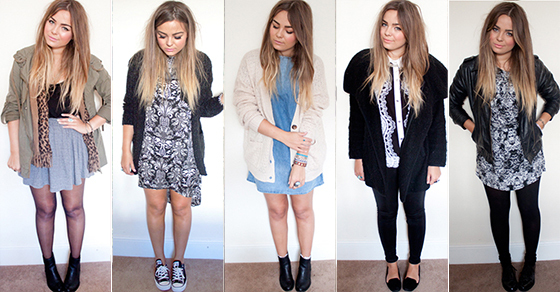 The thing about my blog is I genuinely post what I wear that day on the day I blog about it. My style is very "samey" or "unadventurous", I wear a lot of black (I'll never understand why some people find that so odd!) and I tend to go through phases of liking different things but it is genuinely what I wear. I didn't really start blogging to inspire people, just to record what I wore and then the side product of that was sharing them with like minded people. I don't particularly think Im stylish or fashionable, I wear the same sorts of clothes as most people my age. It's overwhelming at times hearing that you inspire others and that people bought something after you mention it! I like the idea of sharing the best of what the UK hughstreet has to offer. When I started blogging over three and a half years ago I didn't think "highstreet" style blogging was much of a thing, it was completely dominated by "super bloggers" with eccentric but impeccable taste with seemingly endless bank accounts. Although, I'm those types of blogs biggest fan, but it's also nice to see a huge uprise of affordable and obtainable fashion blogs coming through over the years too. This is amazing! It's great to see how your style has developed but stayed true to you too. You have impeccable style, I wear a lot of black too, you can't go wrong! great post! and happy new year lily! wow, I love this post! such a cool idea. Happy new year! It's so cool just to see what the average girl wears and how you don't have to have thousands to still be fashionable and still stay true to your own style and personal tastes. Amazing style you've got there. 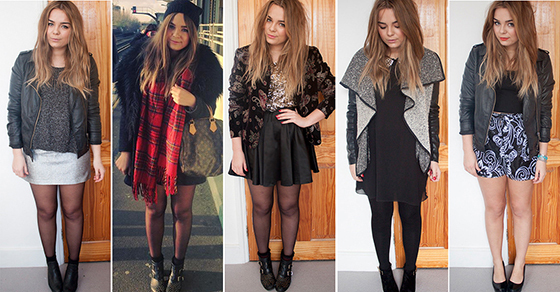 It's nice to see a nice mix of different styles, cute, edgy, chic etc and all really suit you :) Well done! Can't wait to see your spread for 2013. Couldn't agree more with your last statement, where do they get their cash from?! You're style is super cute and thanks for a great year of reviews! it's incredible that you can create that many outfits! i adore!! 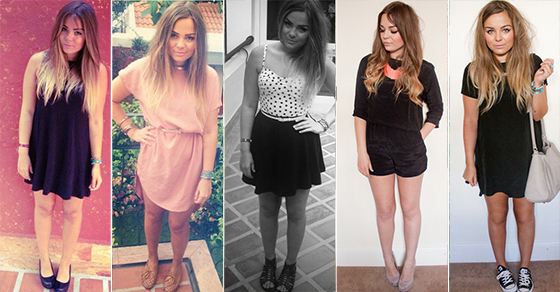 I love seeing all your year's outfits stitched together like this! 164 outfit posts is an amazing achievement for a year! and makes such a difference to actually being able to see your style adapting. certainly something to aim for this year - nice work! You would certainly take gain access to on entire Game. Leo Playcard it running quit the factor could be to buy or require coins to continue. thanks or this pics. i love the 3rd pic from 4th line. After that, to take care of the work problem, myloweslife Log right into your Lowes Life account. So sweet pics. Thanks! For sharing your views regarding this topic. I really enjoyed your post. You must visit Tango for PC. I love your post you have shared here on your site. I would like to share it with my friends on all my social media accounts. Thanks for writing such an informative content. You must visit garageband for pc .